is a mixture that includes Beeswax, Linseed Oil and Damar resin. It is smooth, thick and firm. When mixed with oil paint, the Cold Wax/oil mixture dries faster. It is easy to use and can be mixed with pigments, powdered metals, marble and other fine art materials. Damar and Beeswax have a synergy together. The Damar increases the melting point of the Beeswax and strengthens it. 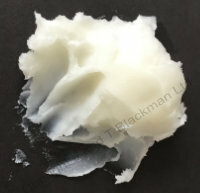 The Beeswax protects the Damar from oxidisation and gives it flexibility. Quite a magical relationship. This means the Cold Wax is more stable and has a higher melting point than Beeswax alone. A' knife full' of Cold Wax spread onto some primed paper, give a good indication of the thickness and consistency of the un-mixed wax. It can be used in this state to seal and protect items, as a wax varnish for a painting, as a 'polish' for picture frames and the like. Add pigments, embellishments and metallic powder to the wax before applying to a painting or surface. Also Pastels, powders, mica flakes, glitter, graphite and 'acquired' additions. It is not recommended to add any water based products, it may 'seem to work' but over time there will probably be oil/wax/water movement and disintegration of the damaged elements. Use oil paint, oil pastel, dry pigment, but, not water mixable oils or acrylics. Water mixable and acrylic need water to work - wax does not! Adding water via the paint medium will cause a weakening of the painting structure, besides the cracks and potholes/marks in the finish appearance. spread of wax/paint Cold Wax with Oil Paint. Even though it was heat tested as described above, it is not designed for use with heat. Heating wax mixed with oil paint is heating the 'unknown', not a recommended practice. Furthermore, for those wanting to use heat with wax, then it would be better to use 'Encaustic' supplies. 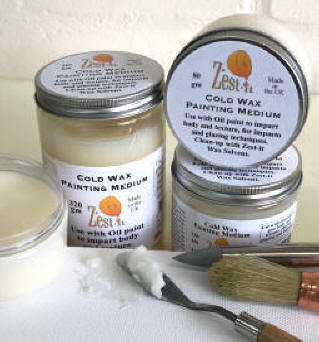 When mixing Cold Wax Painting Medium with oil paint, mix them together, a little or a lot whatever is appropriate. The image right is an example of a single spread of lightly-mixed wax and oil paint. Some suggest specific ratio proportions of 'this and that', 'don't use more than 50%' etc. Wax and Oil have been used together for many years without issue, it also depends on the quality of the product as to its longevity! Mixing the wax and oil paint together before applying is the optimum way, however, the oil paint and Cold Wax Painting Medium can have more mixing, moving and manipulating on the surface. 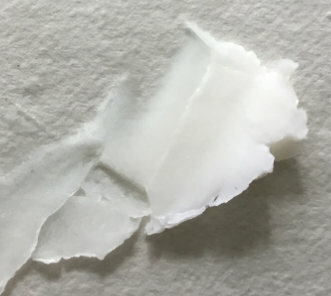 The Top image is dry pigment placed on the wax before mixing together with a knife. The dry pigment will have a drying/shortening effect on the wax, which makes the wax feel more firm and less creamy. Adding 1 drop of Zest-it Cold Pressed Linseed oil or Zest-it Clear Painting Medium will rectify the mixture, or of course you can use it 'as is'. The Bottom image shows the dry pigment mixed into the wax. 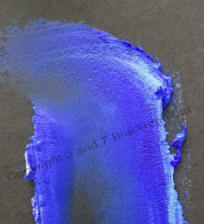 This mixing has little effect on the colour and intensity of the pigment. If you prefer not to add CPL oil to the mixture, then add just one drop of Cold Wax Solvent to the pigment. This will 'wet' it, before mixing together, makes incorporating the pigment much smoother. Copyright 2001 - 2019 © Jacqui Blackman. All Rights Reserved Worldwide.